I’m always investigating new diets and trends in foods. Recently, I learned about the Raw Food Diet, or Living Food Diet, where you eat mostly uncooked, unprocessed and organic foods. In the Raw Food Diet, you don’t cook your foods higher than 115 degrees F because many foods lose their nutritional values and essential enzymes at higher temps. There are several different off-shoots of the Raw Food Diets – Raw Veganism, Raw Vegetarianism and Raw Animal Food Diets. When food is cooked at over 112 degrees (this temperature can be felt as warm to the touch) we destroy all of its enzymes. This is a problem because we need enzymes for every function in our body. To walk, to talk, to breathe and to move; life itself depends on them. As we age, our bodies natural source of enzymes becomes depleted and we need to replenish this source through the foods we eat. If we do not do this and we continue to eat cooked foods, then we eventually begin to use up our body’s enzyme reserves. Cooking makes it harder for our bodies to break up and digest the foods that we eat. This food then begins to get stored in our bodies as toxins; which can lead to all kinds of diseases and illness. While I’m not on the Raw Food Diet, I am intrigued by it and its purported health benefits. There even is a raw food restaurant in nearby Beverly, Mass., called Rawbert’s Organic Garden Cafe. They serve breakfast, lunch, dinner and desserts. Menu items are made of quinoa, kale, flax, squash, and nuts. You can get pizzas, pastas, pies and more. I’m especially intrigued by their Nut Butter “Squash” Ravioli with beet ravioli shells, walnuts and cashew alfredo. I don’t quite get all the science behind not cooking your foods to certain temperatures, but I really want to learn more about this interesting diet. So, I was really impressed when I found out one of my coworkers is on the Raw Vegan form of the diet. She was even planning on going to a raw food potluck but it was canceled so she had some leftovers of this Fake Salmon Pate made with nuts, red peppers, onions and olive oil. I didn’t really know what to expect. It looks exactly like a pate. (I won’t repeat what Brett said it looked like.) 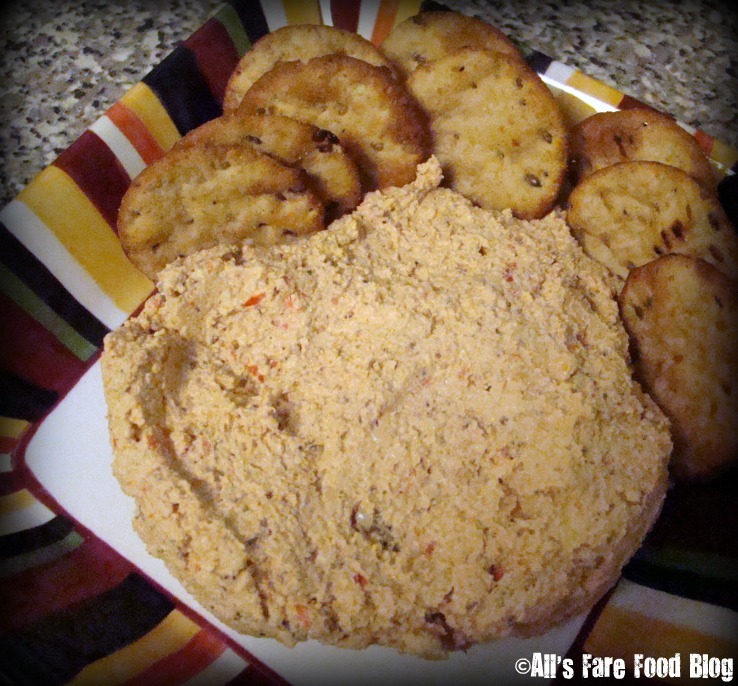 But, served with some whole grain crackers from Trader Joe’s, this faux pate was like a great, homemade hummus. It had lots of notes of the red peppers and it wasn’t gritty from the ground nuts. Even Brett thought that it tasted really good… and if you can fake the hubby out with something, that’s a true winner! Serving suggestions: This can be served on a plate as is, over a salad, rolled up in a green leaf, or spread on crackers. This entry was posted in Cuisine - American, Dieting, Places - Boston, Places - Massachusetts, Places - New England, Recipes and tagged Alissa Cohen, Beverly, fake, Massachusetts, pate, Raw Food Diet, Rawbert's Organic Garden Cafe, restaurants, salmon, vegans, vegetarian by Christina. Bookmark the permalink.